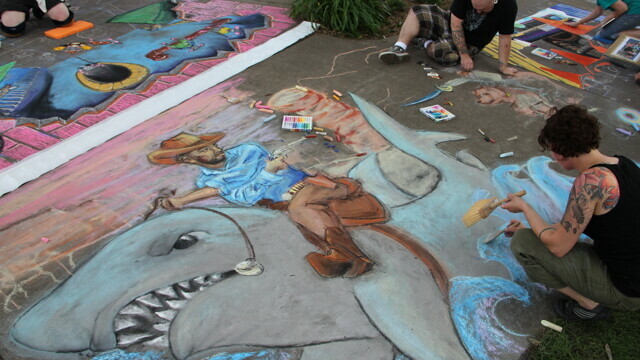 2011: Swimming through another Chalkfest. It rained at Chalkfest. For the third year in a row, right at the climax of the entire event – an event where the only known nemesis is excessive moisture – the heavy summer rain poured down from the heavens washing away hundreds of collective hours of effort. Don’t get me wrong, it was still a beautiful and successful day in Wilson Park with record numbers of people coming out to see a record number of artists doing their thing huge all over the sidewalk – but come on Mother Nature – three years in a row? We do often celebrate the temporal nature of Chalkfest. It’s one of those magical happenings where you have to be in the right place at the right time to experience it, and if you’re too late, it’s gone. Well it just so happens the last three years it was gone a bit quicker than we’d have liked, as on August 6th, at precisely 4:55pm central standard time, Chalkfest 2011 was declared dead. Many had already finished, but some were still toiling away. Thankfully, everyone involved had a pretty good attitude about it. If an artist is uncomfortable with the fact that the work won’t last, they wouldn’t be there. And luckily, we have evidence of their efforts and talents on VolumeOne.org, where you can find dozens of photos of the artists’ creations. So it wasn’t a total loss, not at all. But let’s hope next year we have just a bit more time to bask in the creativity and eat an ice cream cone.